It is an antioxidant vitamin needed for the formation of collagen to hold the cells together and for healthy teeth, gums and blood vessels; also improves iron absorption and resistance to infection. Vitamin C is typically synthesized in sufficient quantities in the kidneys and/or intestines by microflora within the gastrointestinal tract of reptiles, so if internal synthesis were impaired by renal or intestinal disease than dietary sources may be insufficient to meet requirements for this vitamin. vitamin C deficiency causes the onset of scurvy which may be identified by sudden skin rupturing or spontaneous bleeding from the gums. Scurvy can cause reduced collagen synthesis or decreased strength of certain tissues, including skin and blood vessels. Vitamin C deficiency is suspected to be important in the occurrence of mouth rot (stomatitis) in reptiles and also other problems such as poor wound healing. Vitamin C deficiency may also occur in reptiles fed on rodents that possess a deficiency due to underfeeding prior to being offered as food. 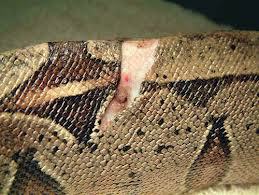 prey animals should be fed adaquatly before being fed to the reptile or culled and stored. Oral supplementation of ascorbic acid may also be recommended.